There is more to Pittsburgh than just black & yellow, the steel workers and a long stringy rapper who happens to date a model with no hair. Since appearing on our radar earlier this year with “Stuck On Fly”, RayDawn has come forth as an artist with abotu enough juice to carry his own James Bond flick. Considering that Controlled Chaos was a smashing success, the re-up is much like Ian Fleming’s signature character – glossy, smooth and comes with big names attached to it. 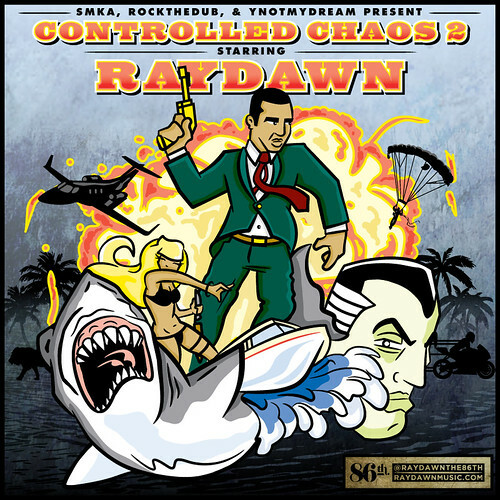 Sponsored by SMKA, YNotMyDream & RockTheDub, Controlled Chaos 2 finds Ray squarely in the middle of his own coming of age. He’s felt knightly on the lead single “Heir” and “All Night”, both definite club tracks but Controlled Chaos 2 is more than that. Merely a reminder that the young man has promise and intends to further capitalize on it with the precision of a Golden Gun.